Given the limited capabilities of the early consoles, almost any individual sport found its way onto the major systems, to make up for the lack of quality team sports games. This week's random pick came up with just such a game -- Magnavox's Alpine Skiing for the Odyssey^2, a downhill contest with some odd technical characteristics, published in 1979. 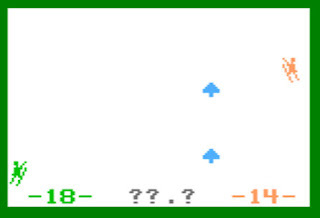 The 2-kilobyte cartridge supports two players, and ONLY two players, as was often the case with the early games. The game appears to be a split-screen affair -- there's no dividing line, but each player's side of the screen scrolls independently. There are three different events available -- Downhill (following a prescribed track), Slalom (skiing through the flagged gates) and Giant Slalom (a longer version of Slalom) -- but they all control and play very much the same. The goal is to get through the course as accurately and quickly as possible. Pushing the action button accelerates the player's descent, and skiing side to side is slower than shooting straight down. Colliding with a tree (even the slalom gates are marked with trees, not flags) costs the player some recovery time. The skiing figures are fairly detailed, with quite a few animation frames, and for a pleasant change are not the standard little Odyssey^2 men available from the system's built-in ROM library. But there's nothing particularly Alpine about this Skiing -- the solid white background is unbroken by anything but the trees, and this could just as easily be Existential Void Skiing. 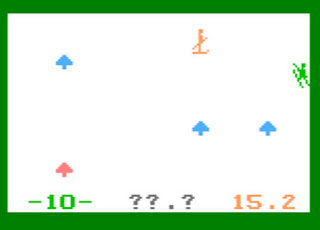 Some strangeness occurs because the Odyssey^2 can't really handle a split-screen display, and so either player can ski out of bounds to the other side of the invisible (and non-existent) split, while the scrolling maintains the appropriate rate on the player's original side of the screen. This tends to look very odd if the players are skiing at different speeds, or one is not moving at all, and it completely destroys any illusion that we're looking at unique perspectives. The timer stops when a player goes out of bounds, and no points are earned while gates are missed, but it's fun to goof around this way -- probably more fun than playing the game legitimately. Was it that difficult to limit the players' horizontal movement? 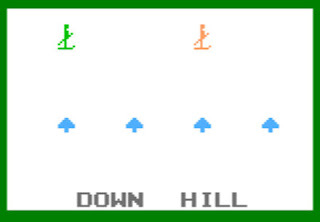 Anyway, whether we attempt to ski properly or just have fun tumbling down the hill, bruising our kneecaps and harassing our opponent by refusing to scroll at the same speed as the hill, like some kind of skiing phantom that's a phantom on skis, eventually we reach the end of the course. Even if we don't have a human opponent, we can try to beat our own personal best time, which always seems like a lame substitute for actual gameplay. And that's about all there is to Alpine Skiing. It's another of those vintage games that reminds us that $20 or $30 buys a lot more gaming entertainment today than it did during the "golden age."